It can be overwhelming to look back on the works of the Old masters. 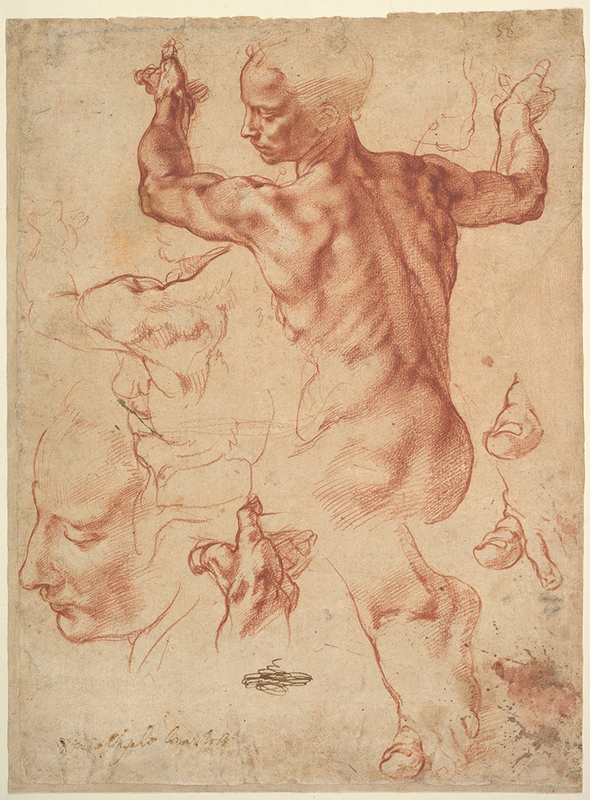 From unfinished underpaintings (such as Leonardo’s St Gerome) and preparatory studies (such as Michelangelo’s study for the Libyan Sybil) through to the vast and imposing (The Sistine Chapel itself) or the apparently simple yet magical and moving complete works (Rembrandt’s Self Portrait as St Paul), there is a simple and nearly incomprehensible power of form and meaning. And with so much diversity between them, how can we even define what the nature of their greatness is? I think of them as “inspired craftsmen”, experts in their field who studied, often with scientific rigour, their subjects, materials and methods. They were hardworking, diligent, eminently practical, and logical in their approach to making the most extraordinary of artworks. At the same time, the first-rank of these artists of history injected something else into their work - some intensity of emotion or psychology or sheer visual strength that is hard to quantify. Sometimes they seem to contradict each other (in terms of what they prioritise in their compositions), but nonetheless individually remain great, containing an internal logic that undeniably captivates us. They did something other than replicate an algorithm of production - there was something profound guiding their cultivated competence. Truly, it seems they were guided by the Muses. So which came first, the competence in craft or the inspired genius of expression? I would argue that the two are mutually dependent, that the yearning, searching energy that drove their pursuit of practical competence and excellence, was then facilitated by their craft to find its visual realisation. As Malcolm Gladwell describes in his book “Blink” leaps of intuitive genius are not automatic - they must be cultivated by repeated practise within a discipline. Intuition can be disastrously misguided without sufficient competence in the field. He argues that people require specific, sequential steps to guide their action in dealing with complex problems, and as that sequential processing becomes internalised, it is then possible for alternative methods and intuitive leaps to emerge. For us to merge with the process, and have it flow through us. In other words: through the humility of diligent repetition of the right process, we open the door for the genius of the Muses to enter. In the case of the Old Masters, the apprenticeship system meant that the young artist was given specific processes to follow, and by repeatedly following them, gained mastery over them. From this point, they could reach out into other possibilities, but a core framework to building images was set. Leonardo arguably transcended Verrocchio (even from a young age as the famous story about “The Baptism of Christ” goes) yet the approach to visual representation and the image making he learnt in his Master’s studio was present until the end. Today, we are overwhelmed with possibilities - with subjects, artistic media, and audiences with every taste imaginable. In this context, one of the great challenges we face as practising image-makers is to figure out what limits we will set to our creative work. Counterintuitively, it is precisely this setting of limits that can be one of the most inspiring and exciting things we can do. By setting limits - the boundaries of a “creative arena” if you will - we have generated the compositional problem to solve, we have generated creative questions. Repeatedly solving these problems we gain a plastic feel for this creative territory (see article #3 about plasticity), and it becomes possible for something truly excellent to emerge intuitively. It seems paradoxical - through the limitations of the creative arena, that a freedom of artistic expression opens up. As indicated above, finding these limits is one of the key challenges facing us today - there will be contradictory advice from all sides telling you what you ought to do and not do, and these opposing voices advising you might be quite artistically successful individually. So the young artist has to navigate all the conflicting advice themselves, working out what creative arena they want to work within, based on their aptitudes, inclinations and the type of artwork that they truly aspire to make. In itself, this is a multidimensional problem, and one that includes perhaps the most difficult of all questions - that of personal authenticity. By this I mean: what work would you do in a perfect future? Or in a world in which you were not influenced by your peers and and family judging your actions? If you have ever seriously contemplated these questions, you will have discovered more than a few demons and often, more questions than answers. One of the central purposes of TIAC Academy is to provide a framework to assist students navigating these questions for themselves, that can begin the unfolding process of finding the creative direction of their work. We have set the limit for the scope of teaching to representational sculpture and painting, to these traditional fine arts. This is far broader than many Ateliers (focussed on the approach of one particular master) and far narrower than many university art departments (often grooming students to transgress traditional forms as the ultimate in artistic excellence). Within the degree program, students are exposed to our framework of the Four Studios, which are essentially 4 broad creative arenas that you might wish to place your efforts upon. Once understood and briefly experienced through trying them out, the student chooses one of these frameworks as a primary focus, they will be guided through approaches to this way of working to make work in this creative arena, perhaps refining them with elements they wish to bring in from other approaches. What do I mean by “Subjective Empiricism”? While it is meant to be a little tongue in cheek, I am pointing to the attempt to be more objective in your observations of your subjective experiences, to what approach truthfully appeal most to you. How? As aspiring artists, we can look at existing artworks, or the patterns in the artworks of a certain artist or movement and logically analyse the types of elements that make them up, the types of processes that went into them, and the cultural context that gave rise to them. Through this, we can define the “rules of the game” of that artwork, artist or movement, and try out playing that game ourselves. Through this aesthetic analysis and practical trying out certain creative arenas, we can discover what we are most drawn towards. It is my conclusion that it is better to trust our authentic artistic inclination (even if hard to determine) rather than impose an aesthetic philosophy on our work and risk creating propaganda (this is roughly what the article Challenges for young artists argues). A well illustrated example of how this could play out is “The Hunt of Odd Nerdrum” a documentary that surveys in some detail the artistic influences of Norwegian painter Odd Nerdrum (he is also on the TIAC Academy International Board of Advisors). This series is perfectly transparent about how various influences shaped his approach - for instance, he took early inspiration from the “creative arena” of Munch, before Caravaggio, Rembrandt and Titian began to more strongly influence his aesthetic hierarchy. The documentary does a great job of holding up the influence beside the work Nerdrum executed in this period. This seems to reveal a very ernest and humble investigation that Nerdrum has undertaken across the decades of his career, at each stage exploring the lead of a certain painter but ultimately making it his own, and achieving excellence in his own right. In order to help analyse artworks, artists and movements, and make comparisons between them, I have developed a conceptual model. The idea is first to consider the work(s) in terms of the elements, processes and context that shaped it, and then to make some kind of statement of the core “creative arena”, the aesthetic hierarchy it seems to have emerged out of. Through this, we can define the “rules of a game” we may want to try playing. A cyclical process: Pictorial Elements (A) are combined via some Orchestration Process (B) to produce a Physical Artwork (C) that is experienced by the Audience/ Society (D). In entering the world, it enters the cultural continuum, and so becomes part of the general source of Pictorial Elements. 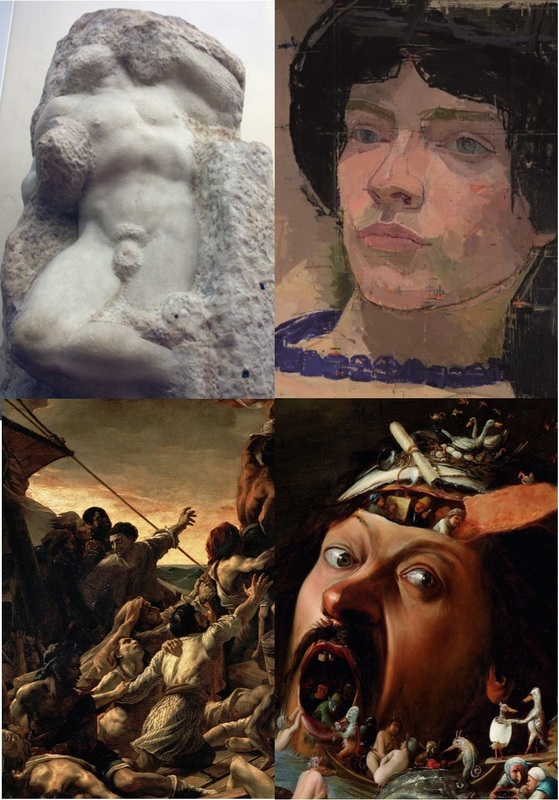 Pictorial Elements (A) include any qualities, attributes or content that we could define in artwork, and therefore recombine into a new composition. This includes subject matter or content (A1), design or visual arrangement (A2) and material media used to make the physical artwork (A3). The purpose of this is to begin to have you considering artwork in terms of the its constituent parts, which remain as devices that you might like to borrow and recycle into your own work. The Orchestration Process (B) covers the activities undertaken by an artist from initial impulse, the inspiration (B1), through exploratory phases (B2), to the actual execution of physical artwork (B4), which must find a kind of equilibrium or resolution (B4). This process is conceived as cyclical because each work can guide the development of subsequent ones, each study for an image can rehearse the final execution, and even the work intended as the final piece, is likely to be unresolved or prompt further cycles of inspiration and exploration to modify the piece towards resolution. The physical artwork ( C ) is the work manifested as an object, entering the shared space of our world for viewing by the Audience/ Society (D). All these points are interrelated. For instance, the knowledge of what the audience knows and understands, or the context in which the audience will receive the artwork, may be explicitly or implicitly taken into consideration during the Orchestration Process of the artwork, or the selection of Pictorial Elements (see the example of Gericault’s “Raft of the Medusa” below). Another example of how the parts are interrelated: the choice of which Pictorial Elements are chosen will change what types of processes are desirable or possible. The list of categories of potential Pictorial Elements is long - and my list here is by no means exhaustive. Think of it as a framework to get you started generating your own lists of elements as you observe artworks and experiment with your own. The list of Pictorial Elements (A) can be added to as necessary - you might identify a certain pattern of design (for instance, what defines the style that Mucha achieves in his commercial images?) or a pattern of combining a media with a type of subject (for instance Andrew Wyeth’s careful use of Tempera painting to depict sharply delineated landscapes and buildings, or Eugene Carriere’s thin, misty depictions of human subjects). It can include the usual aspects of representational composition such a characters and narrative, tonal and colour scheme, 2D and 3D pictorial design, and the types of materials used in the work or its development. It can also include what I would call “meta-elements” - emergent elements that are qualities that can be increased or decreased. For instance, realism is one such meta-element - referring more closely to observed reality in one or more respects can increase a feeling of immediacy or authenticity. Or this may distract from a certain stylisation - it is a matter of balance. Another element might be mystery - the quality of decreasing the definition of certain parts of the picture so increase cognitive engagement (ie the brain has work to do fill in the missing parts) while directing attention to particular parts of the image. Dynamic equilibrium could be another meta-element that we might want to manipulate - either visually or conceptually - the sense that the eye feels compelled to continue moving through the picture, but this agitation exists with a certain visual balance or organisation as well. The Orchestration Process (B) is the (usually) non-linear selection and integration of Pictorial Elements. This is what creativity is, in the sense that I am using it: the novel result is the particular recombination of elements (they have all been used before in one way or another) that your work exhibits - sometimes this recombination is well within an established genre or form and sometimes it stretches between forms, subjects or narratives to create more obviously new arrangements. In my estimation, it is not a given that one is necessarily better than the other - the merit is determined by how insightful or how well the integration is made . For instance, one might paint a self portrait that is distinguished from other self portraits in history only by being of oneself and executed recently, not by being a new form. Nonetheless, if done well (perhaps with a strong sense of the universal in the particular, or the visual presentation of an aspect of the psyche) the contemporary self portrait could connect the audience to the grand history of self portraiture and an experience of the various aspects that has made this form important: psychological, cultural and so on. On the other hand, an artist could combine certain Pictorial Elements in a way that no one has done before in a more general sense - for instance the use of classical forms with a new narrative (for instance Gericault’s “Raft of the Medusa” pairing classical rhythms, human forms and arrangement with a contemporary narrative, or Michelangelo’s Sistine Chapel combining Biblical mythology with the classical forms of antiquity). Or, the use of partially destructive processes of image modification and aggressive mark making (associated often with 20th century Expressionism) with more classical approach to painting the subjects, as is the case in the work of Spanish painter Golucho, also one of the TIAC Academy International Board of Advisors. To summarise: novelty by itself is not sufficient for excellence, nor is sticking to established forms. Excellence comes from the generation of meaning for a given audience, both from the quality of integration and the story told by the integration. Within this definition, there is vast scope for creative possibility, and the axis of novelty (in the sense of relating universals to references of the specifically contemporary human experience) to universality (in the sense of continuing the tradition of expressing the human experience without explicit connection to the contemporary) becomes a gradient from which one might select an appropriate boundary for one’s creative arena. The Physical Artwork (C) can take on a life of its own, an object that contains a cultural and personal energy, as though the making of it, through the brush marks or blows of the chisel, magic has been locked into this artefact. The object can contain such cultural and social significance that great risk and cost are offered to protect or acquire it. There is the implication that the artist touched this, and through their hand the society or culture from which they emerged did so. The World, the Audience, the Cultural Continuum (D). Nothing is made in a vacuum and artworks are nearly always made to be seen, to exert a subtle (or not so subtle) influence over the social context of their making - from simple viewing pleasure to religious transmission or political propaganda. Who the work was made for, and what they understood and cared about, was key to the transmission of meaning that is at the heart of representational art. The degree of specificity of the target audience is a parameter that influences the making of artwork - from the broadest appeal to human beings in general, to a specific cultural group with idiosyncratic motivations and tastes. The MPC can help us articulate the essential creative arena of a given artist, artwork, sequence of artworks, or artistic movement, by pointing out the context, content and process involved. This can help us determine the creative arena we ourselves wish to pursue excellence within. By focussing our efforts on a particular creative arena, we can develop our skills, deepen our understanding and recognise who could provide assistance in developing our work in this direction. Through cultivating the craft represented by a particular Creative Arena, we give ourselves the possibility of achieving an intuitive, plastic control within. At this point, if we are lucky, the Muses might smile upon us. Now let us turn to the more detailed analysis on a particular artwork, to articulate the Creative Arena within which the creative integration has been achieved. We can consider the general framework to provide a range of topics to enquire about - what are the Pictorial Elements utilised? What processes were involved? And so on. And then ask the really important question: which aspects were particularly important for the generation of meaning in this work? The answer essentially defines the Creative Arena of the work - the aspects the artist had to juggle together as they worked towards resolution. In comparison with this example of a single artwork, in which the factors important to the identity and meaning of the work are sought, we can also compare a series of artworks by one artist or multiple artists within a certain movement and look for the aspects that are shared. Through this, we may gain insight into the Creative Arena this artist or artists were wrestling with. Joaquin Sorolla’s series of scenes from around 1900 - 1910 analysed in terms of the Model of Plastic Composition. What defines the unique quality of this series? Consider how different the result and intention of these works by Sorolla are to the painting by Gericault, though many elements are also shared. The ways you could use this model to analyse artworks, series of artworks, or groups of artists is nearly unlimited, and you will be surprised what you discover about the patterns that emerge, that you can then work with in your own way. To achieve excellence, we must focus our efforts within a certain Creative Arena. Through diligently repeating our attempts within this arena, we deepen our feeling for possibilities of meaning defined by those limits, and can gradually begin to express subtleties or sheer power that might otherwise be mute. The question of excellence is fundamentally one of how the integration of elements works - neither the elements nor the processes will be new because they have all been used before, but the way you recombine them and breath life into them can be new and meaningful and wonderful, with sufficient experience and intensity. To get there, you must define the boundaries of your creative arena for yourself - no one can do this for you. Therefore, investigating the boundaries others have set, in work you admire, is a highly useful process in self discovery and artistic development.